Turn your message into pictures, and pictures into action. Visual Ink is a San Francisco creative services agency specializing in illustration and animation. We specialize in making complex ideas—about technology, business process, messaging—easy to understand. We distill difficult messaging into compelling animations, storyboards and illustrations. Our visual techniques accelerate customer learning and retention. When people learn faster, they take action faster. It’s as simple as that. See what Visual Ink can design for you. Workshops provide a collaborative way to align your stakeholders. Lead by a visual strategist, complex ideas become crystal clear. The resulting illustration drives alignment in a much faster way. True fact: animation and videos can improve web conversion rates by 80%. Visual Ink designs and produces animated videos for products, services and corporate messaging. We’re fast, we’re good, we’re ready to go! Align your product and marketing teams around compelling UX storyboards. Visual Ink helps by designing user scenarios, persona development, and the buyer’s journey. Visual Ink is at the forefront of leading strategy illustration workshops. These workshops bring business people together to draw—literally and figuratively—their common future. In doing so, they create lasting business alignment value. We drive a collaborate and exhilarating process that always ends with customer delight. We’ve developed and tested visual methodologies to get powerful results at every level of business, from the boardroom to the executive briefing center, and across vertical industries. Corporate leadership — Activate your workforce by showing them the big picture, where they fit in, and what they need to do to succeed. Sales executives — Engage your customers in a process that wins sales by deepening intimacy, co-creating account plans, and differentiating sales presentations with a major ‘Wow’ factor. Agencies and consultants — Get results by creating and presenting clear visual outcomes that all stakeholders understand and support. With an explainer video on your landing page, good things happen. Search engine ranking goes up. Visitor conversion rates increase by 80%. Companies who use animated video see an average of 49% faster growth in revenue. Visual Ink animated videos get to the point quickly. Visitors will easily understand your value proposition, and take action quickly. The key to product development excellence is clarity about the customer: Who are they? How do they behave? What do they want? A user experience (UX) storyboard communicates this to align all of your stakeholders: product managers, engineering, developers, marketers, partners, and executives. 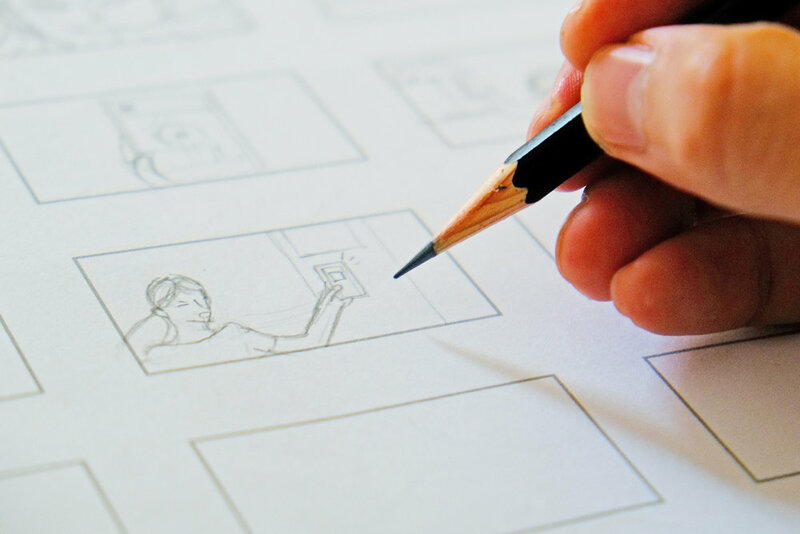 Visual Ink creates concise UX storyboards that articulate depth. We capture rich details that make it easier to understand the user’s environment, actions, emotional state and logic.